Help students develop powerful written communication skills with SRA Writing and Language Arts, a supplemental program designed for grades K-6. This stand-alone or supplemental program offers a teacher-directed and systematic style with explicit teaching philosophy while addressing skills that students need to improve writing and language arts proficiency test and standardized assessment scores. 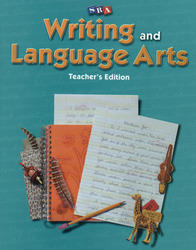 SRA Writing and Language Arts teaches students to write effectively in each of the fundamental forms of writing through step-by-step instruction and models. This distinctive program thoroughly covers the writing process from prewriting to publishing, the six traits of writing (ideas, organizations, word choice, sentence fluency, voice, and conventions), and language arts skills such as vocabulary, spelling, grammar, usage, and mechanics. SRA Writing and Language Arts teaches these specific skills simultaneously rather than in isolation to help students connect ideas and apply the skills in a writing context. Additionally, writing rubrics provide clear and specific vital feedback that targets areas for improvement. Systematic and explicit instruction, models, and practice in many forms of authentic writing prepare students to write in any situation, including proficiency tests. Easily adapted to fit many types of language arts curriculum models, these comprehensive writing activities offer the flexibility teachers need to meet various language arts curriculum standards.